Smartphones have revolutionized the way we access information. Mobile web usage has seen a massive jump over recent years. And since it surpassed desktop usage there have been many efforts from tech giants to make the mobile web faster. Luckily, we were not the only ones who realized there was something wrong with the web performance on mobile devices! In May 2015 Facebook launched Instant Articles, a solution for publishers who distribute their articles on Facebook and want them to perform better on mobile. Shortly after, Google introduced the AMP Project, an open source initiative to improve the performance of the mobile web with a strong focus on speed and loading times. In this post, we will explore some of the best WordPress plugins to generate Google AMP pages and Facebook Instant Articles in a very easy way. If you still don’t know what’s the difference between AMP and Instant Articles, which option could be the ideal for you, or if you should embrace both, this post may help you to decide. The AMP plugin by Automattic makes it super easy to create AMP articles. After activating this plugin, all posts on your site will have generated AMP-compatible versions. You can check the AMP version of your articles by adding /amp/ to the end of the URL. For example: www.yoursite.com/name-of-the-post/amp/. Since version 0.4, this plugin added a Theme Customizer (Appearance > AMP) where you can see how your AMP pages look on mobile. It also lets you change the header background and link color, the header text color, and the color scheme. If you want to add more styling, track traffic on AMP articles, or simply get more functionality for this plugin, you should use some of the plugins below. AMP for WP is a highly configurable plugin to automatically add AMP functionality to your WordPress pages, posts, categories, and tags. With this plugin you can customize your AMP pages in a very easy way. It includes a drag-and-drop post builder to change your design elements. If you want to track traffic on your accelerated mobile pages, it allows you to connect multiple third-party analytics providers. It has support for 12 companies including Google Analytics, Chartbeat, or Alexa, among many others. AMP for WP supports Google AdSense and DoubleClick as well, which means that you can add and monetize advertisement within your content. But that’s not all. This plugin has many other features and premium extensions that will let you extend and customize AMP right according to your requirements. Glue for Yoast SEO & AMP is a complement to the AMP plugin. As its name suggests, this plugin “glues” Yoast SEO and AMP. In other words, it makes sure the default WordPress AMP plugin uses the proper Yoast SEO metadata. Once you have set up this plugin, just continue configuring your Yoast SEO options as usual. It will ensure that search engines discover your AMP pages. In order to integrate your WordPress site with Instant Articles you need to create a RSS feed which has to be approved by Facebook. The RSS feed contains data about each article such as title, header images, or body content. Facebook has a review process to verify that all Instant Articles generated from your site are properly formatted. They also require a minimum number of articles in your feed. You can check Facebook’s documentation here for more details about this process. Luckily, the Instant Articles for WP plugin will help you with that as it creates a new type of feed for you, making sure that your articles meet the formatting requirements. However, you might see some errors depending on the theme or plugins you are using. This plugin handles all the basics. Once activated, a new menu will be available for you to connect to your Facebook Page. Before you can start publishing your Instant Articles remember that you need to have a Facebook App. This is an essential requirement for setting up FBIA (Facebook Instant Articles). The appearance of your articles is managed using Facebook’s Style Editor, but it is quite limited to the templates they have available. This WordPress plugin also allows to display advertising within your content and enables third party analytics to be used with Instant Articles. Adding FBIA on your WordPress site is not as simple as installing this plugin. As you have probably noticed, there are some initial requirements that you need to know before start publishing. We highly recommend reading this step by step tutorial from WPBeginner as it will walk you through all the process. 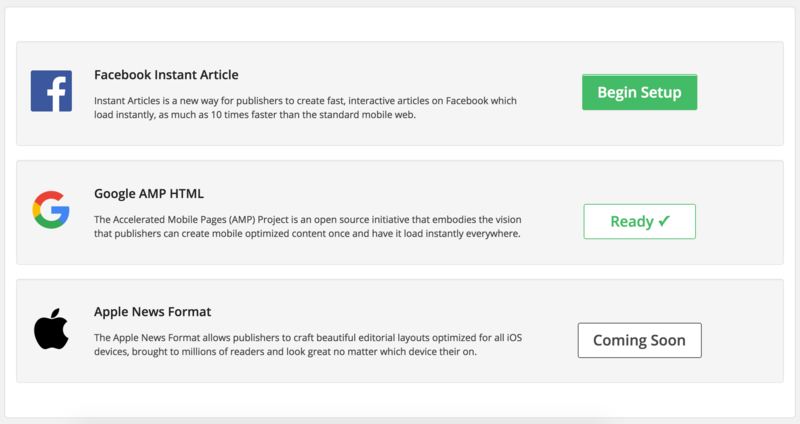 PageFrog is a free all-in-one WordPress plugin for content creators to publish and manage content for Google AMP and Facebook Instant Articles in a single interface. After its activation, a new menu item (on the left) called “Mobile Formats” will be available. Go there and click the ‘Begin Setup’ button of Instant Articles. Then, PageFrog will automatically generate a RSS feed for your site and guide you through all the steps of the setup process. The Google AMP setup is quite simple too. Just follow the steps in the popup to install the Automattic’s AMP plugin (which is a requirement). PageFrog enables you to customize your AMP styles with live mobile previews. But also connect multiple third party analytics to your FBIA and AMP pages using Google Analytics, Chartbeat, Parsely, and more. In addition, it supports Facebook ads and Google AdSense so you can monetize your content through these platforms. The WordPress Instant Articles plugin creates a RSS feed for your WordPress blog. Once activated, you must go to the settings screen to specify your Facebook Page ID and prepare your feed for publishing on Facebook. This plugin supports right-to-left publishing, copyright information on each article, and third party analytics and tracking. 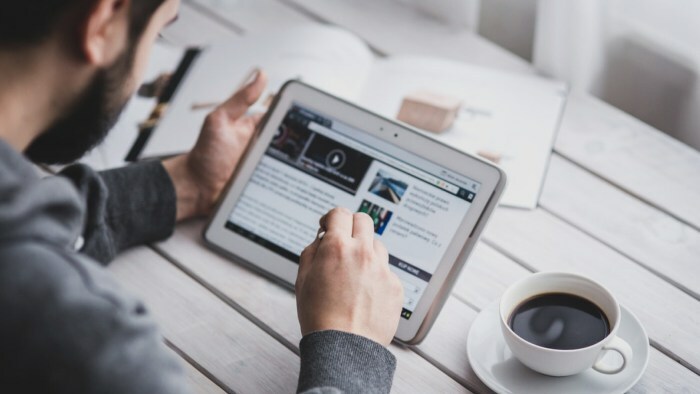 If you’re looking for a way to monetize your content it also connects Facebook Audience Network and Direct-Sold Ads to your Instant Articles. If you publish on your site often, this WordPress plugin can be a useful tool to organize and manage your Facebook Instant Articles in one place. Integrating Facebook Instant Articles and Google AMP on your WordPress site may seem a time-consuming and tedious process. But both are solutions that benefit publishers in many ways. By providing a better user experience on mobile devices, your visitors are more likely to engage with your content and spend more time on your site. Are you currently using any of the above plugins? Tell us about it in the comments section below. PageFrog isn’t working…. Support is ZERO, never answer…. Hi, I’m sorry to hear that, we installed this plugin a few months ago and it worked fine for us. Have you already checked their support forum on WordPress? Looks like there are more users now who are having problems too, you might find a solution there. Hope they fix it soon. Keep us informed! Sides, we are loaded with many more features right out of the box.